By the middle of the 70s Brian Auger's Oblivion Express had ceased to be a cutting edge force in music and had morphed into trend followers. 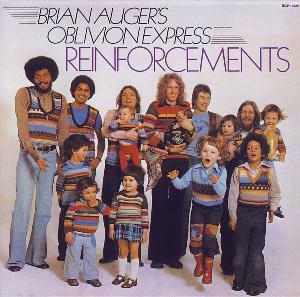 While it would be easy to pick "Reinforcements" (with its adorable, family-friendly cover) completely apart for not being as groundbreaking and prog as their 1971 "heavy" fusion debut, that really wouldn't be fair because the quality of the musicianship here remains high and there's a lot to be said for that. Also, they (like other bands too numerous to mention from all corners of the planet) were caught up in the "play that funky music, white boy" tsunami and the pressure to climb aboard that gravy train coming down from the heads of the record labels must have been overwhelming. Herbie Hancock's masterful "Headhunters" LP in '73 had brought supercharged funk into the jazz rock/fusion world and the opening instrumental salvo of "Brain Damage" is a product of that influence. It's more or less a controlled jam where Brian's electric piano is good, Jack Mills' guitar isn't and Auger's Hammond organ is up to his usual fine standard. You're even treated to a short bass break from newcomer Clive Chaman and a percussion/drum segment from Lennox Laington and Dave Dowle, respectively. The whole busy 8-minute thing is a sign of the times, in essence. The R&B "Thoughts from Afar" doesn't fare nearly as well, though. Alex Ligertwood is back in the fold once more and, while his singing is not as screechy as it was on "Second Wind," his vocal on this cut is as poor as the boring arrangement and dated Moog synthesizer lines. If it weren't for Brian throwing in an ethereal electric piano ride it would be a total waste of recording tape. Chaman's "Foolish Girl" is British soul music that gives off a strong Earth, Wind and Fire vibe but the tune is better than its predecessor and doesn't insult your ears. Auger turns to his trusty organ for his solo and that's always a plus in my book. The untimely death of former drummer Robbie McIntosh inspired the spirited, heartfelt and upbeat tribute song "The Big Yin" where they bestow the ultimate honor for any musician upon his memory with the phrase "he was a man who made us all good." Brian's up-to-snuff Hammond lead does this energetic track true justice, as well. The unexpected success and close proximity of the Average White Band (two former OE drummers were part of that ensemble) obviously rubbed off on the group but Ligertwood's "Plum" is just an inferior imitation of their unique style. For some reason a lot of freckled Caucasian singers in that day thought they could sound like Stevie Wonder but more often than not they just sounded silly and foolish as Alex demonstrates here. This track is a "skipper." But about the time you start thinking this album is a total washout they perform Laington's distinctive change-of-pace instrumental "Something Out of Nothing." The number's slick Brazilian jazz groove is infectious and when Chaman displays his versatility by performing admirably on flute you have to give the band kudos for trying something new. In addition, Brian's hot electric piano makes this tune samba from beginning to end. Auger's surprisingly prog "Future Pilot" also goes a long way in saving the album from fan obscurity and disdain with its inventive chord progression and jazzy vocal melody. Brian delivers a strong Hammond organ ride to emphasize his true calling and things stay on the up and up until late in the cut when they escalate the song into double-time (ala their heroes, Santana) and Mills spoils the mood by desperately trying to capture the fire and intensity of Carlos. He fails, but he doesn't keep the song from being the highlight of the proceedings. At first I had considered giving this effort the dreaded single star rating but after listening to it several times I have more fully taken into consideration the confused musical era it's a reflection of and decided that it's merely mediocre at its worst and more than satisfactory at its best. The scourge of disco was slowly but surely snaking its spindly fingers into every aspect of pop culture in 1975 and at least this record shows no trace of that disease. In the final analysis you gotta give 'em thanks and due recognition for that. 2.6 stars.